By wrangling, I mean baby gate. By baby, now I mean toddler on the run. Seriously, this kid doesn’t stop moving. While it’s a blast chasing after him, it’s hard to always be one step ahead of him- literally. He gravitates towards our steps, like he knows they’re dangerous and he just can’t wait to find out why. I bought baby gates a long time ago. It seems like a simple thing, right? Well it’d be simple if we had standard size doorways or stairs that had walls on either side. But we have awkward sized doorways and railings on one side of our stairs that don’t line up with the wall across from them. For a long time I just chased KB around, making certain he was never unsupervised by the stairs. When his first birthday party rolled around, I knew I couldn’t just leave the stairs open and inviting to all his little rugrat friends- what kind of host would that make me? I scrambled for a solution. It’s not the best and not completely childproof, but it certainly slows Kabes down. Please note: I’m not telling you to do this. It’s just what we have going on in our house. I searched Pinterest for inspiration and got the idea from this gate, then just made my own version as I went along. The key was using these cable organizing cords, as they easily come on and off one handed to put the gate up and down. The other side of the gate is tied to the stair railing, and there’s a hook on the back wall to hang the gate when it’s not barricading the stairs. Now this is obviously a fabric gate so it’s not entirely babyproof, but it’s working for us so far. And it’s cute. Always a plus. The upstairs was a different story. For awhile we used one of the cheap-o old fashioned gates, but it only fit halfway down the hall, not giving our on-the-go toddler much room to run around. After nagging the husband about it relentlessly, he came up with a solution and gave me a sturdy baby gate at the top of the stairs. He used industrial strength double stick tape and some wood blocks to make the gate fit on the stairs. Life is much easier now that I know the pitter patter of little feet running down the hall won’t end in catastrophe. Where Are My Organs in Pregnancy? We’re going to my parents’ next month and they have a staircase like yours. I feel like W would just push through the fabric until he ripped it! Does K try to do that? We have a similar situation at the top of our stairs… we used two pieces of wood that go around the rail… they sell sets at Bye, Bye Baby. You definitely need the ones at the top of the stairs to be THE MOST SECURE. Yeah… we already had a “situation” pre-gate… definitely secure now! This may be what I need for our staircase, since it’s a very awkward setup as well. 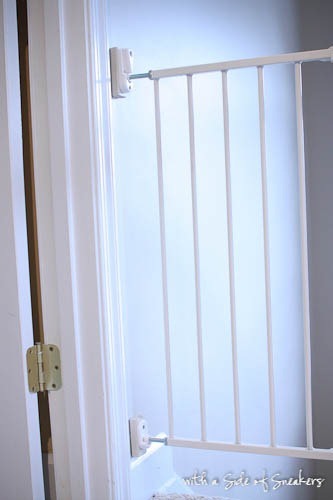 Do you have any kind of bar through the top and bottom of the fabric or do you just have the cords running through the seams and then pull it tight enough that it blocks the staircase? 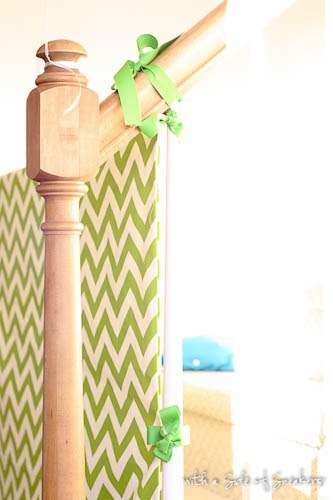 I was thinking I could do something like this and then roll it back to the railing when not in use? Thanks for the great idea! Where did you find this fabric? How did you measure for the fabric? or do you still have the instructions? thanks! I have the same situation with my staircase, only its an older dog i need to keep from going up and down the steps. I am making this for my granddaughter. I am using bungie cords through the top and bottom casing. Thanks so much for this. I’ve been acting as baby gate and I’m worried that he’s getting too fast. This solves our “don’t drill into the walls” problem. Ok so Ive seen a ton of people use these… do the cord bundlers hold up to kiddos pushing on it? In my head I see them just popping off. Only mildly – I wouldn’t use them alone from a safety stand point, but they are good at delaying them from getting by. I only use it at the bottom of my steps. Even at two and a half, K is yet to actually pull it off. How do you use this to keep f err on going room to room living to kitchen. I do not want to purchase a gate and spend so much money but think with brackets or pressure mounting is what we need…..help!!! 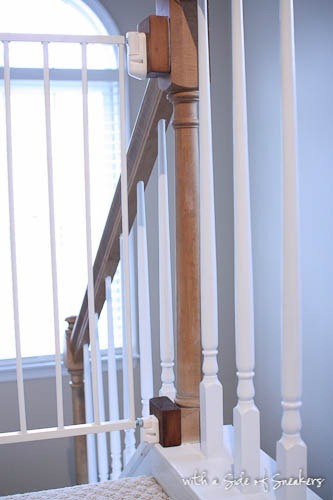 Its crazy because your stairs, carpet, wall, EVERYTHING looks identical to my house except the bottom of my banister isnt wood. But i thank you so much bc ive tried everything to figure out how to baby proof these steps but my living room is so small i didn’t want to just confine her to just that. 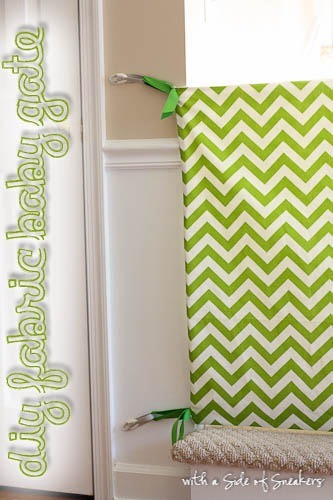 I had a similar idea to this but just didn’t know what to hold the fabric to the wall with. Command hooks, GENIUS. I just have to find some heavy duty enough to keep her from pulling it down. Again, thank you so much for sharing! My daughter is having a baby this summer and we need a gate to protect big sister from falling down the steps. Where do I find the directions to make this?